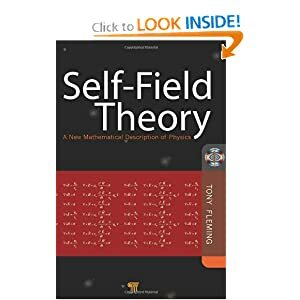 Self Field Theory (SFT) is a deterministic version of quantum theory based on a series of analytic solutions to the Maxwell-Lorentz equations recently discovered by Dr Tony Fleming who has 35 years professional research in electromagnetics, antennas, communications, bioelectromagnetics, bioeffects, bioEM medicine and numerical methods. Dr Fleming is a member of the Bioelectromagnetics Society (BEMS) with a Ph.D. (Monash) in computational bioelectromagnetics. This site aims to educate the reader in the wide spectrum of applications to SFT. At its most basic level SFT is a new field theory that allows us to zoom in on particles and see them as 'self-fields'. The equivalence between a particle and its internal fields is like Einstein's equation of the equivalence between mass and energy E=mc², the relativistic kinetic energy of an atomic particle of mass m. And like atomic chemistry, there is a coherent structure within the various bosons that SFT calls 'photon chemistry'. This structure like that within the atom is fractal, recursive to many levels perhaps infinitely deep below the photon level. The reader will find recent articles about the origins of quantum theory , errors within quantum theory, double slit experiment: from Young till now and recent insight into relativity. In a recent effort Bohr's early Quantum Theory of the atom has been completed matching the early deterministic results obtained by Bohr and pushing on to get the mutual magnetic fields of both particles in the hydrogen atom. Enjoy your visit and discover what is just around the corner in science. It's a fascinating adventure into the future of science and technology with a cleaner science and a cleaner world. SFT is evolving; as at March 2016 some key findings have recently been found to be important to current scientific knowledge. An up-to-date precis is given below along with a description of the mathematical underpinnings. In brief there is a correspondence between SFT and quantum field theory (QFT); one deals with forces, the other with energies. SFT reveals both the fields and motions of particles while QFT cannot; the difference is how the fields are described mathematically. In QFT the fields are ubiquitous over all solid angles; in SFT they form coupled spiraling streams of individual photons moving and rotating as both electric and magnetic fields (or within gluons as spiraling streams of triplet combinations of photons and phonons). Differences in how the fields are measured and other theoretical reasons explain why SFT is deterministic with analytic closed-form solutions while QFT is probabilistic requiring numerical solutions. SFT thus gives a more detailed and accurate description of the physical and biophysical world. Peer review has been the priority over the last decade. As well as conference presentations and submitted papers, two books Self-Field Theory - A New Mathematical Description of Physics and Inside the Photon, A Journey to Health are available from Pan Stanford Publishing, and CRC Press. The effort now shifts to this website - to present a coherent and integrated view of SFT. Older pages need updating over the next few years. The inequality known as Heisenberg's Uncertainty Principle (HUP) can be seen to be closely related to the central equations of SFT. Applying SFT to the case of the electron's motion in the hydrogen atom, this is an electromagnetic (EM) problem involving SFT's bispinors that describe two coupled fields-the electric and magnetic fields of EM. While in HUP there is one inequality relationship, in SFT there are two equations that are both exact. Apart from these important differences the relationships are identical as visual inspection reveals. The HUP inequality relationship is shown in (1) while the two SFT equations are shown as (2a-b). The underlying physical reason for the two equations is the treatment in SFT of both the electric and magnetic currents due to a particle's motion, compared to only the electric currents in QFT, neglecting the magnetic currents. The terms 'magnetic current' and 'magnetic field' are not found in the index of books on quantum theory. This shows that quantum theory is incomplete as Einstein maintained till his death. This is the key mathematical relationship behind SFT and the reason for the determinism of SFT as opposed to the probabilistic nature of QFT. In these equations the Δ signs mean first-order measures of difference whereas the SFT equations come from differentiations. HUP is commonly considered a fundamental limit to what is knowable at the smallest scales. In the context of (1) and (2a-b) it is a theoretical error. In the matrix methods used with quantum theory HUP is a form of numerical error to the closed-form solutions of SFT. In the existing quantum theories we find we have an over constrained problem requiring probabilistic solution methods (Arrivederci Uncertainty). What mathematical price do we have to pay for getting rid of uncertainty in SFT? We require a change in the way the fields are treated. We add another ordinate by measuring the fields between centres of motion rather than directly between charge points as in the Liėnard-Wiechart potentials, the conventional way in classical EM. This boils down to not using the hypotenuse but the two sides in a triangle of distances; now we have two distances, not one. And this is the reason why the hydrogen atom can be solved in closed form and why the photon is composite and not a singularity; it now has internal structure. Extending our knowledge at the big end of the size spectrum Hubble discovered that the local group “stars" were in fact other galaxies in the 1920’s at Mount Wilson Observatory using a new 100" telescope. Analogously while QFT saw only an uncertain blur, SFT finds structure within the photon, an extension of our physical knowledge at the very small end of the size spectrum. It seems there is an identifiable organization within photons and other field particles, known to particle physics as bosons,. Previously thought to be “elementary,” the composite structure of ordinary photons appears similar to that of the hydrogen atom obeying a similar SFT system of equations. This provides a “photon chemistry,” similar to atomic chemistry, to explain some features of bosons including W+, W– and Z0 bosons of the electroweak force and gluons of the strong nuclear force. Phonons also sit under this theoretical umbrella and a stoichiometric equation can be written in terms of gluons, photons and phonons. Three gluons rotating in three orthogonal directions fit within a modified system of Maxwell–Lorentz equations providing a basis for a dynamic solution inside nuclear regions. So far our knowledge of nuclear reactions has grown from the time when the two Curies, Marie and Pierre, studied pitchblende in the 1890's and slowly realized the power and danger of this new technology; now that a new vista of theoretical nuclear knowledge opens up before us let's hope we've all learnt our early lessons to be careful with this tricky but potentially world changing new knowledge. In SFT relativity is best understood via the bispinorial motion of the photon and its composite internal structure. With the SFT formulation the observed ‘space’ and ‘time’ includes internal and external motions of the photon. What we see appears warped but in reality it is not. In SFT Planck's 'constant' is found to be intrinsic to the formulation and appears to be a variable of motion. Empirically the value of Planck's constant comes from the equations of SFT. Since v0 = r0ω0 = 5.469222 × 105 m/s, we can compare with the known value of Planck’s constant with our estimate to an accuracy of 7 significant figures. Thus the basis of SFT is more fundamental than the various quantum theories where Planck's 'constant' is inserted heuristically into a mathematical statement of the eigenvalue problem as it applies to waves. Numerical solutions resulting from Sturm-Liouville theory as it applies to waves were known in 1920's as quantum theory evolved into a matrix method. In SFT the formulation includes a mathematics that provides a simpler non-numerical solution to the eigenvalue problem ab initio. The field structure of the Universe is fractal having four (or more) distinct levels of gravitation, not one as previously thought. The first level at the solar system level is a differential of EM field theory. It consists of dielectric and dimagnetic components, i.e. bispinors, two component spinors, hence there are two rotations just like EM field theory where there are two fields, the electric field and the magnetic field. In comparison to the EM case, the solar system gravitation is differentiated so that the cyclotron motion now adds to the orbital rotation and does not move in an orthogonal plane as does the magnetic motion in atomic level EM; this intriguing fact was the basis of Einstein's calculations of the precession of Mercury in about 1916. At the galactic level there are three fields, not two as in EM; now we add the phonon as well as the photons of the electric field and the magnetic field. The phonon is identical to the photon but the acoustic field is directed head on (longitudinal) to the direction of external motion. In nuclear regions these three fields can form gluons in high-energy regions. When this mix of three fields (gluons) is differentiated the spinors now move in three distinct rotations. Hence within each galaxy there is also an up and down motion (rotation) in addition to the orbital and cyclotron rotations. Now there is a three-way system of forces which contributes to the solidity of all matter within each galaxy. Hence in SFT there is no need for any 'dark matter'. There is a flow of bosons transiting between all solar systems and their planets with the black hole at the centre of each galaxy; within Earth's crust there is a steady flow of radioactive reactions emitting neutrons and neutrinos, while protons originating from cosmic sources are flowing down from the upper atmosphere via lightning strikes and other weather related phenomena. This is analogous to the flow of photons between each planet with its star in each solar system. At the solar system level the electric fields from the Sun reach the Earth's equatorial regions colliding with atoms, turn 90° , become magnetic fields and flow out of the polar regions; these then flow to the polar regions of the Sun, collide with solar atoms, turn 90° , become electric fields once again and flow out of the solar equatorial regions thus completing cycles that match the flow of photons in their role as binding energy inside atoms. There is also a valid structure for a four-field interaction at even greater distances. Now there are two distinct dielectric rotations in the radial direction, plus a single dimagnetic rotation, and a single 'diacoustic' rotation (up and down). Hence we now see that this rotational structure supports a 'tube-like' or if you like a 'string-like' gravitational structure at huge distances compared with galaxies. Moving to a five-field structure we might even see tubes or strings forming at even greater distances; now the tubes or strings would show a bispinorial structure. Perhaps at the universal level this might indicate a structure of 'multiverses'; otherwise the universe would be seen as the end of the series of fractals. Note that we can see why Newton's classical gravitational theory and Einsteins general relativity theory are both accurate across the universe at each level of the visible fractal. The mathematics of gravitation has the form of a double sided infinite series, remembering the photon is composite possibly to an infinite degree on the small side of the size spectrum. Here relativity again plays a crucial role in shielding out only those domains we can sense. It seems our innate mathematical abilities are profound indeed. Basic finding is that evolution of the Universe controls biological evolution - small elastic unicellular taxa such as microorganisms first, then larger taxa such as fish and mammals with cartilaginous and skeletal structure later. While early life is forming so too are the Earth and the Galaxy; the Earth is moving away from the Sun and cooling, while the Galaxy is also spreading out and becoming more solidified as time proceeds; this is controlled by the expansion of the Universe. Evolution is a 'top-down' process where cosmology comes first then biology comes later; this is a function of the forces involved. Both cosmological evolution and biological evolution appear in large part deterministic rather than inherently stochastic. This means the Big Bang may not have been indeterminately chaotic although the evolving Universe does appear to be fractal in regards fields, mass and gravitation. Overall biological evolution does not depend just on random natural selection. The link between cosmology and biology is seen most clearly in the way both solar systems evolve (wavelength λ, increases as energy drops as expansion proceeds) and galaxies evolve to have a more three-dimensional structure (solidity vs time increases). Hence we find that small flaccid organisms were first to evolve then larger skeletal structured creatures. See also Gravitational Structure of the Universe below. This link lends credence to the possibility of life having evolved elsewhere on suitable exoplanets in our own galaxy or in other galaxies. The apparent uncertainty and capriciousness of the 'small picture' at the terrestrial domain appears to be different to the determinism of the 'big picture' seen at the galactic level. In other words there are spontaneous mutations that appear to 'drive' evolution from below in a seemingly random way over short periods, while the cyclic nature of the Galaxy (e.g. observed cycles within the marine fossil record) can be seen to affect evolution in a deterministic fashion over much longer time periods. Thus there is a complete difference in science's way of viewing these two opposite factors within evolution. As well, while there is the observed competition between species, there is also a cooperation between cells that enables species to replicate. As well as competition enabling adaptation of a species, the principle of cooperation adapts as cosmological time proceeds to enable the life-form to continue to survive. Hence survival of the fittest is augmented by the survival of those species that learn to cooperate. Just like the complementarity of wave and particle picture of light or yin and yang picture within Chinese medicine this is a similar complementarity of seeming opposites in evolution. It may be that scientific knowledge itself evolves in jumps like quantum energy level shifts, and appears like an onion. Knowledge resembles a fractal where scientific knowledge is measured relative to absolute reality at a point in time in human history like a knowledge onion. Overall science asymptotes towards a more complete description of reality as time proceeds; human ignorance tends to diminish as time proceeds. Thus in time we may learn to understand the geophysical mechanisms behind earthquakes and tsunamis allowing countermeasures to save lives in places and times at risk. Also see discussion below concerning dielectric tissue constants of various life-forms that can provide an observable measure of the time sequence of evolution among and across taxa. As a consequence of the composite photon within SFT (see above), and the fact that there is a recursive need for fields at each successive level below the sub-photonic level, the photon has an internal structure that resembles a fractal, both a single photon with many levels inside it, and a bosonic fractal structure involving many different bosons forming different levels (our universe). Note that the whole universe is potentially an infinite fractal including all life within it. Thus all known physics is observed to be a fractal structure extending from the domain of the photon to the domain of the universe. Much of biology is known to involve many fractal structures. Life too may be based on the composite photon with its fractal structure at the small end of the size spectrum. Hence there are possibly fractal levels within life itself, as well as biology and the physical universe. Our memories, thoughts, loves, beliefs, etc may be able to be stored as information in these photon fractals. This may be one reason why life extends beyond death. Death of the mortal body via physical means cannot destroy this internal photon structure and its layers of stored information; it is outside the energy levels inherent within the Big Bang and ongoing expansion of the universe. Thus human life (perhaps all life) may have a reality beyond physical death as the Bible says. NOTE: The terms 'fractal', 'domain', 'gauge', 'diffeomorph', etc all mean slightly different things to different scientists, but they are all talking about a set of self-similar structures; in mathematics the term 'non-linear infinite series' (e.g. geometric series) is also composed of self-similar entities. Fractal-like structures are seen throughout physics and biology. Cell can be understood in terms of the electric and magnetic fields that evolve within a colony of cells surrounding a fertilized cell over the gestation period culminating at metaphase when the fields near the centre of the colony are strong enough to pull the chromosomes into two identical halves. This process is also a slow build up of the electric and the magnetic fields within the fertilized cell. The physics of the DNA at any point in cosmological time when a species first appeared is related to the Solar energy at the Earth's surface (the Solar blackbody spectrum, the photon density) at that point in time. There is also an effect due to the rigidity of the Galaxy (related to the phonon density) which determines how elastic or structurally rigid a taxa can be at a point in cosmological space and time. The Stark Effect is the exposure of atoms to moderately strong electric fields such that there is a splitting of a single state into several states. The physics is understood predominantly as a way of changing the quantum state of an atom and is often described as an analogue of the Zeeman Effect, a similar splitting of states into several states by exposing atoms to magnetic fields. What is not so well understood are the physical stages of these different states. As shown below, each state corresponds to a different elliptical orbit of the atomic electron. As the electric field increases, the higher becomes the eccentricity of the orbit. This is accompanied by the release of photons by the molecular structure. This is exemplified in mitosis when electric fields build up during gestation. This involves the chromosomes cleaving into two chromatids. The mathematics of SFT has an analytic form as two spinors with a phase constant. Note that the angular velocity can be quantum and have negative and positive values. There are two distinct forms of this phase phenomenon: one is via the electric orbital motion that is charaterized by strong bonds, while the other the magnetic form is much weaker. and controlled via the magnetic cyclotron motion. The magnetoreceptor that involves the magnetic sense of species including migratory birds, whales, and insects may possibly be related to this weaker effect where a movement may correspond to an atomic force and an ionic current able to influence biological cells. DNA sequences may be related to the quantum spin of the bases within the chromosomes also related to the cyclotron motion. This effect is likely to be a near field effect related to the magnetic fields of the histones, ball-like coiled DNA sequences found within chromosomes and used in the transcription and copying of the DNA after mitosis. Atomic structure can be seen to be a bispinor acting on each particle where the orbital motion of the electron is seen to be very much stronger than its cyclotron motion. This applies to the macromolecules DNA, the carbohydrates, lipids, and proteins. In terms of fields being able to influence these two distinct types of motions, external (exogenous) fields are less able to affect the processes of DNA and the output of neuronal activity than endogenous fields such as ionic currents and intracranial currents. This implies the individual has a certain degree of free will in order to think, move, decide, and control our bodies; external fields do not naturally have this ability. Neurologists have studied both the conscious and sub-conscious mind since Freud before WWII. Magnetic transcranial stimulation can be shown to override the conscious choices of subjects being stimulated in real time. This may also imply that while there are domains that are mainly deterministic there is also a small level of chaotic fields within that same domain, for example the atomic level. It may be that the numerical values of dielectric and magnetic constants of biological tissues relate to the evolution of the Earth, the Solar System, and the bigger picture of cosmological evolution during the expansion of the Universe following the Big Bang. When each tissue first evolved, the Earth was more energetic. As the energy of the Solar System attenuated with time, these tissues needed to find more energy to replicate successfully; hence the tissues adapted and their dielectric constants became numerically bigger as the Universe expanded after the Big Bang. E.g liver has a dielectric constant of around 10,000,000; it was probably one of the first physiological systems of life; fats in the brain, bone, cartiledge are lower because they are more recent in the overall picture of evolution. Thus, like studying the rings of trees the dielectric study of tissues in various extant animals may give us an experimental way of measuring evolution across and between the many taxa of biological life forms going backwards in time. In 1905 Albert Einstein succeeded in unifying parts of classical mechanics and Maxwellian electrodynamics. He ultimately failed to unify the rest of physics. SFT completes this unification and then some, especially within the biological sciences where photonic processes are intimately involved in how the cell and the DNA work. In particular SFT continues the line of 'wet work' started by Alexander Gurwitsch's 'mitogenetic' radiation and later by Ross Adey's 'window effect'. SFT sees EM exposure of a cell as a form of gravitation (somewhat like the forces involved in Earth's motion) that can be both biogenic or e.g. via a mobile phone. SFT also gives a theory on which to base nuclear physics; quarks can be modeled inside protons themselves inside atoms. SFT also suggests a link between cosmological and biological evolution. As any plausible theory should, SFT provides predictions from photon to universe. As all of us involved in present-day physics know, the hydrogen atom has been solved since 1927 using the quantum theory (QT) that emerged after Planck in 1899 and Einstein in 1905 discovered experimental proof for the existence of the photon. Their concept from their experiments was of a regular particle that was discrete and could be physically counted. They felt this photon could be restricted in space and time to a localized region wherein the particle existed. In the subsequent years, after QT developed into a quantum field theory (QFT) the concept of the modern enigmatic photon emerged somewhat different to that envisaged by Planck and Einstein. It was found theoretically using the mathematics of QT that the photon could not be confined to a local region in space and time. This set up a historic and crucial debate within physics about the issue with Planck and Einstein on one side and Bohr, Heisenberg, and others on the other. In the 1920's the only way to solve the potential equations of the hydrogen atom was via the Sturm Liouville (SL) eigenvalue theory. The experimental value for Planck's constant that Planck had determined in 1899 was simply substituted into this SL theory (it is important to realize that Planck's constant did not belong with the SL theory from the start but was simply inserted into the preexisting SL theory). It is here in the solution method that the problem became probabilistic rather than deterministic as was the conventional case for solutions to differential equations. Probabilities were found to give an accurate solution and subsequently it was thought that 'atoms in reality worked that way'; in actuality they were needed due to the way the fields were being measured. The mathematics of solving over-constrained problems is discussed elsewhere (Arrivederci Uncertainty). In addition the underlying Maxwell's equations on which the Lagrangian equations of QT were based could not be solved either at that time. Bohr's theory of the hydrogen atom which provided some correct frequencies used only the electric fields and currents within the atom modeled as two point charges, the electron and the proton. Again in reality part of the reason for the difficulty was due to the way the fields were being measured. Seeking to match the number of unknowns with the number of equations the unknown error ( the way the fields were being measured) was compounded in trying to solve both Maxwell's equations and the equations of QT by ignoring the magnetic fields and currents of each particle in the same way as the electric fields had been examined by Bohr. An examination of the index of books on quantum theory at that time or even the present-day have no listing concerning magnetic field, magnetic current, etc. So Einstein was correct when he said quantum theory was incomplete. There was only one scientist who attempted to use both the electric and magnetic currents within quantum theory and that was Herbert Fröhlich. In hindsight knowing how SFT handled the problem in 2005 we see there were two problems: (1) the fields were being measured incorrectly (2) the magnetic currents of particles were omitted in the formulations. Within some of the halls of academia today, this whole story about the origins of quantum theory is treated by assuming Heisenberg and Bohr were 100% correct. The complete solution was found using SFT in 2005. Now the solution is no longer probabilistic but deterministic; there is no need for the Copenhagen or many-worlds interpretations, only a straight-forward solution method. The 'weird' quantum world supposedly 'observed' at the atomic level can finally be seen as nothing more than numerical error due to the incomplete theory on which the atomic solution was based. This is now obvious to those of us who use numerical methods and have experience of the way truncation errors, modeling errors etc due to finite element or finite difference methods appear as numerical noise in the overall solution. Now once again the photon can be viewed as Bohr and Einstein originally envisaged it: as a localized particle, more correctly a composite particle consisting of many particles that move creating waves both inside the photon and outside. But this new mathematics is an insight into a new world of fields and particles. Particles can now be viewed as dynamic interactions between many internal particles. The concept of an infinite fractal emerges within the photon. The self-fields of particles can now be examined much more clearly by science. Using this new insight into fields and particles new technologies may well emerge including microscopy, telescopy and the synthesis and development of medicinal drugs with reduced side-effects. There's now a new mathematics, Self-Field Theory (SFT) to test against the physical world in addition to the various quantum theories. So this is 'the new kid on the block'. One of the new features of this form of mathematical physics is that it does not use Lagrangians but rather uses what are called Maxwellians. In other words, this is a maths that is one degree of differentiation below the Lagrangian; essentially it is about fields and forces rather than potentials and energies. I've italicized 'field' because it has been traditional to use the term field when we are actually talking about potentials; further, field has a special, reserved meaning in electromagnetics. Moreover, potentials should only be used in connection to wave equations and not where actually fields such as electric, magnetic, and acoustic fields are involved. So don’t get confused about what a field is in SFT, nor a potential. So let’s look at the hydrogen atom. If we take the four Maxwell equations and add the Lorentz equation, we find we can solve this system of equations totally deterministically, no probabilities. The solution is closed form in the tradition of classical solutions. If we look at our equations, we have two curl and two divergence equations. We find the solution is a bispinor. The solution is the addition of two spinors. Note these are NOT the same as Dirac spinors that are unitary and used within the algebra of quantum theory. Here, a spinor is a physical entity, like a vector that rotates, for instance a particle motion. So we have a solution consisting of two rotating vectors. These two rotations are why relativity works when we come to studying the photon, but this is moving ahead of ourselves in this first blog. There’s an intimate meaning to those four equations of Maxwell. We have two curl, two divergence, and now two rotations. Does this imply that one curl equation, and one div equation can be related to one rotation? What if we add a curl and a divergence, does this now refer to a third rotation? Is this what is happening inside the strong nuclear region of atoms? Yes. Our new Maxwellian and our new system of ML equations can be solved and depending on the parameters relating to the third set of curl and div equations, the equations are stable. So does this relate to the insights of particle physics? In brief, yes. But again we move too quickly for this first blog. So if you’ve picked yourself up from the floor, and caught your breath about what you’ve just read, we’ll summarize. We’ve found a solution to the atom that is deterministic and another by modifying the ML equations that may apply to the nucleus, and another by taking a differential form of the ML equations to form a gravitational solution, involving dielectrics and diamagnetics. All these solutions are deterministic rather than the probabilistic forms of quantum theory. Further, there’s a general solution in the form of a fractal that applies across physics from photon to multiverse and beyond. So there you are. We are seeing a closed form family of solutions across physics.That’s where we’ll stop for today. Much more to relate as you can see. Just to give you some insight into where we are at this point in time now with this theory, there’s reason to believe that an increase in the Galactic fields felt here on Earth may be behind the ozone depletion, glacial melting, and climate change we are observing. We are seeing numbers of neutrons and neutrinos coming up from within the Earth along with numbers of protons coming down from the atmosphere; these phenomena may be linked to more heat being released from radioactive elements such as U-238 within the Earth. Perhaps we may be going through a magnetic flip, or maybe just the beginning of a large magnetic excursion. This is related to the composite photon and the fact that at high energies, such as inside the Sun and the Earth, the internal state of the photon can change, in fact it can flip its inherent 'spin', its magnetic field. Of course our human efforts to clean up our commercial, industrial, and mining act are important in the overall scheme of all things that can change the climate. After we've spoken about some more theoretical matters such as uncertainty and determinism, Planck's 'constant', the speed of light and relativity, we'll talk about the composite photon, and some time down the track we'll get to Earth's magnetic flips.